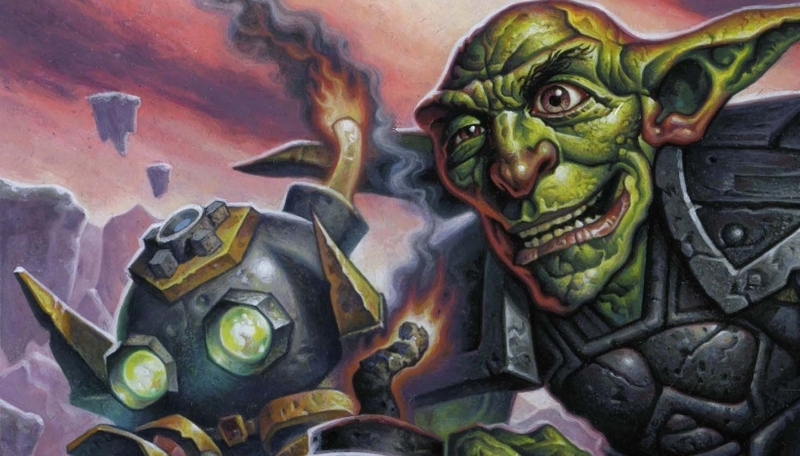 Our Bomb Warrior deck list guide features the best Rise of Shadows deck list for Season 61 of Hearthstone (April 2019). Our Bomb Warrior guide also contains Mulligan advice, card combos and strategy tips. Bomb Warrior is a Hearthstone deck that has already skyrocketed to the top of the tier list just a week into the ew Rise of Shadows expansion. Even after glancing at just a few of the cards being added to the class with the latest set it was pretty clear that was a direction Team 5 was pushing in the new meta. While Blizzard has printed plenty of cards that encourage certain play styles in the past, some have completely whiffed in live play. Bomb Warrior, though, appears to be one of the most competitive decks in Rise of Shadows. With all that attention, we’ve put together a Bomb Warrior guide for players who are excited to try out the deck in Rise of Shadows. We’ve got a full deck list for you to peruse, as well as some general tips and strategy advice for you to consider whether you’re queuing for your first game or a seasoned pro. The main aim of Bomb Warrior is to fill your opponent’s deck with a multitude of Bomb tokens so that every card draw risks dealing more damage to them and steadily whittles away at their health pool. At five damage a pop, this can represent some significant damage over time! This version of the deck is supported by a number of Rush minions that can quickly deal with your opponent’s threats while also pushing for some extra face damage where possible. There’s also a fairly hefty Mech package to give the deck an even more ridiculous late game. There are multiple cards in the deck that pair well with a lot of the Bomb-shuffling abilities too. These can ensure the effects are repeated more often, or help you extract extra value out of the Bombs you’ve placed by providing you with extra minions. Essentially, you want to make each draw for your opponent a terrifying turn of the card to see whether it’s one of their own or an explosive surprise! A fairly standard early game awaits as you simply spend time playing a few minions to get your board presence built up, while removing your opponent’s opening drops. Omega Assembly may be a tempting early play but you’ll definitely want to save it for later unless you’re in desperation mode after a bad Mulligan. You can absolutely start to fill your opponent’s deck with a Bomb or two at this stage using Clockwork Goblin, though it might also be worth waiting until you can combine it with Augmented Elekk to keep up the pressure with more Bombs. You’ll want to start ramping up your Bomb shuffling even more as you approach the mid game, and luckily you have access to tools that make this even easier. Wrenchcalibur is the perfect way to place more Bombs while also maintaining control over your opponent’s board. Now’s the time to take full advantage of the combos available in the deck too, so look to pair Augmented Elekk with Clockwork Goblin on the same turn for some excellent value. If things are looking a little grim, cards such as Darius Crowley and Dyn-o-matic are also brilliant catch up cards should you be a little behind on the board. If they survive then you can continue to push for more damage. Brawl is an option if you become overwhelmed entirely. A couple of late game options in Bomb Warrior can give you that last burst of power to finish off your opponent. One of the standout cards from the new set is Blastmaster Boom, which will summon a number of Boom Bots on your side of the board, depending on how many Bombs are in your opponent’s deck. Chances are at this stage of the game that should be a fair few and enough to wipe out your opponent when set off! Dr. Boom, Mad Genius is also another great way to close out the game as it empowers a lot of the Mech minions in your deck, or those you acquire from using Omega Assembly when on 10 mana. Use these newly acquired Mech minions to finish off your opponent or wait for that agonising Bomb draw that will finish them off. 1. Play a control heavy game in the early stages by using your Rush minions and removal to keep their board in check. 2. Conversely, don’t be afraid to encourage your opponent to overextend on the board so you can wipe everything out with a well-timed Brawl. 3. Many aggro players like to draw through their decks quickly, so ensure you’re filling them up with Bombs to make those card draw effects risky. 4. Wrenchcalibur is usually best against minions, but it can serve as some brutal burst damage to finish off an aggro opponent too when buffed by Captain Greenskin. 1. You should have more time to pull off some of the deck’s more powerful combos in these match-ups, so consider holding off until you can play Clockwork Goblin and Augmented Elekk on the same turn, for example. 2. The deck has very limited hard removal so save Brawl for when you need to eliminate some bigger threats. 3. If you can stay with Control decks until the late game you have some powerful cards to keep you in the contest with the likes of Dr. Boom, Mad Genius. 4. You might want to play a more aggressive game against some Control decks. Race them down with your minions instead of setting up lengthy Bomb kills that they may just heal through. 1. Town Crier: Not too bad stat wise and it also gets you on the board while tutoring some other better cards from the deck. 2. Loot Hoarder: Solid minion to contest the board that also gives you a card draw on death. 3. Eternium Rover: Another way to get yourself on the board right from the off and the extra Armor it generates can be useful in the late game. 4. Clockwork Goblin: As the main aim is to get Bombs into your opponent’s deck you would love to see this in your starting hand. 4. Wrenchcalibur: For the same reasons as the card above, you can start shuffling in Bombs much sooner. - Dr. Boom, Mad Genius is an important card for this deck given the Mech influence running through it. Not only is the impact on those cards massive thanks to the Rush effect, but you also get a late game hero power that gives you a lot of reach as well. - As the main strategy behind Bomb Warrior is to load up your opponent’s deck with a vast number of Bombs, Clockwork Goblin is obviously a big part of the deck. It has decent stats for the mana cost too so work well as standard minion plays as well. - Wrenchcalibur is simply another way to get more Bombs into your opponent’s deck. Having the ability on a weapon is especially nice though, as it allows you to smack away at some minions at the same time - that’s what we call value! - When you play Captain Greenskin it’ll give your weapon a +1 / +1 buff. Not only is the extra damage a neat boost, but it also gives you another swing to add more Bombs into the opponent’s deck. - Perhaps one of the more important cards in the deck, Blastmaster Boom gets so much added value out of all the Bombs you’ve played into your opponent’s deck. The Boom Bots are nice enough on their own but if you get them after gaining the Rush effect from Dr. Boom, Mad Genius then the damage potential is quite ridiculous. - To take full advantage of all the Bomb shuffle effects in the deck you will want to pair up many of those card with Augmented Elekk. You should ideally play on the same turn to prevent the Elekk being killed off before you've had a chance to benefit from it. - Town Crier is an excellent one drop to get you onto the board early but it will also help you pull you other Rush minions which can make for perfect plays a few turns down the line. Omega Assembly: It may take some time for the Bombs to kick in and so Omega Assembly is there to give you even more power in the late game. Town Crier: Draws through to some of the more powerful Rush cards in the deck. Augmented Elekk: You should try and pair this with your Bomb shuffling effects as much as possible to get even more value out of them. Clockwork Goblin: One of the main ways you’ll be able to send Bomb tokens into your opponent’s deck. Omega Devastator: As the deck doesn’t run much hard removal this is one of the few ways you can completely obliterate a minion on the other side of the board. Wrenchcalibur: The second way to shuffle Bombs into your opponent’s deck. As it’s a weapon you can find extra value by killing off your opponent’s creatures with it too! Brawl: Standard removal spell for Warrior that’s great in so many situations. Captain Greenskin: Gives you an opportunity to buff Wrenchcalibur so it can deal more damage and shuffle in more Bombs. Blastmaster Boom: A big finisher that rewards you for all the Bombs you’ve dropped into your opponent’s draw pile. Get enough and you might just win the game off it! Dr. Boom, Mad Genius: Gives all the Mechs in the deck a very useful Rush buff. Meanwhile, the new hero power gives you even more survivability into the late game.